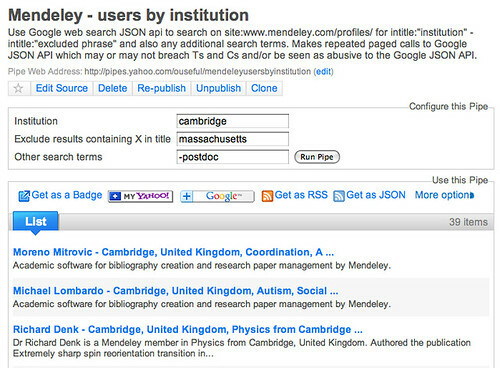 Who’s Using Mendeley in Your Institution? 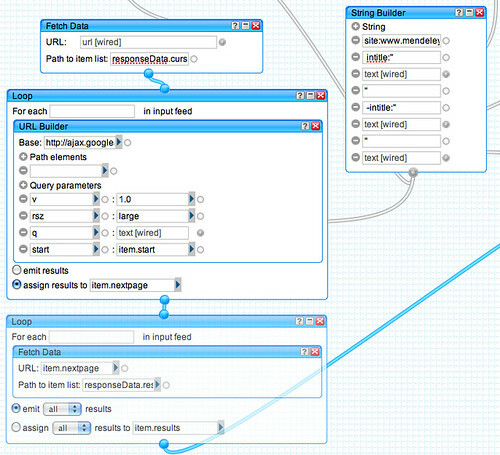 …and it didn’t take long to find an itch to scratch… In a couple of recent posts looking at the extent to which personal document and metadata collections using apps like Mendeley might be seen as a figure:ground complement to a repository, (Comparing Social Sharing of Bibliographic Information with Institutional Repositories, More on Mendeley and Repositories), Les Carr started to explore “the extent of Mendeley’s penetration into a University. What is visible is the public profiles that Mendeley users have created. Although the Mendeley API doesn’t allow searching for users, I have been able to identify 53 public profiles from the University of Cambridge through Google (and a lot of manual verification! )” [my emphasis]. Hmmm… Sounds like that was a bit of a chore… can we finesse an API for that, I wonder? What else can we learn just by looking at the search results? 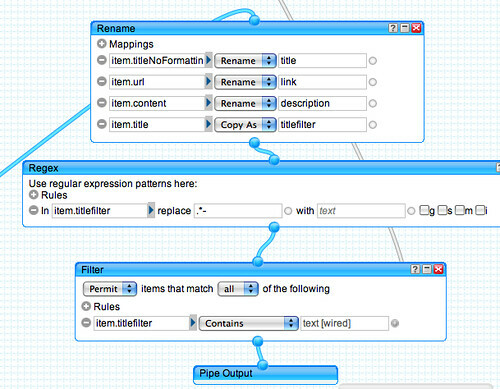 We’re now in a position to build a Yahoo pipe to create some sort of API to provide a Mendeley status search. 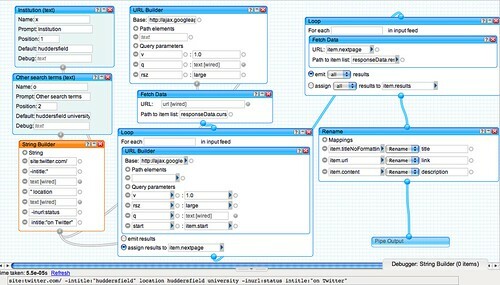 A good way of getting Google search results into the Pipes environment is to use Google’s AJAX search API. The Google AJAX search API returns either four or eight results at a time, along with an indication of how many other “pages” of results there are, as well as an index count that identifies the index count of the first result on a page. (So for example, on the first page, the index of the first result is 0. For pages with four results, the index of the first result on the second page is 4, 8 on the third, and so on.) The first results page is complete – we actually get the search results listed. 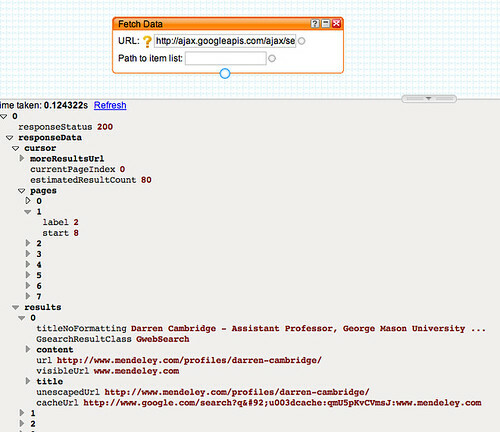 But the API also provides a list of the other results pages available, and the index of the first result on each page. To call results from the later pages, given the index of the first result, we use the additional URL argument &start=index. 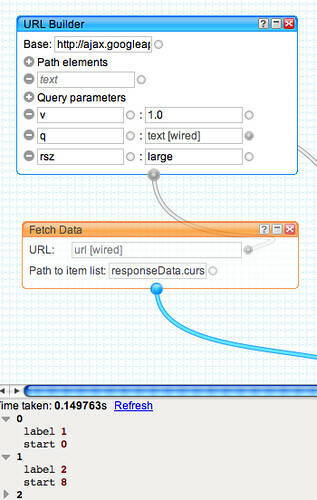 Note that we are using the same query string that we used in the original search. (Also note that we only seem to get at most 64 responses; maybe the page list for pages later than the first page provide indices for more results? That is, maybe each results page only lists at most indices for 8 pages of results? Having got the search results, we rename the results attributes to generate valid RSS elements (title, description, link) and do a spot of post filtering. very interesting work! 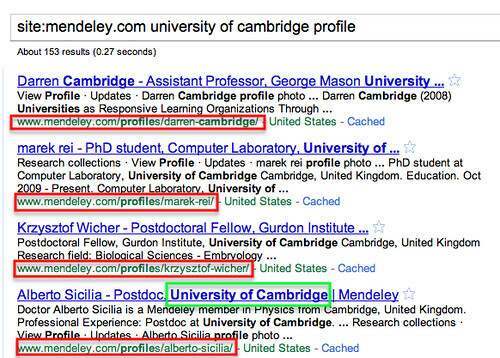 Just wanted to point out that Mendeley’s internal people search (https://www.mendeley.com/search/) shows roughly 600 people at Cambridge – but Google apparently hasn’t gotten around to indexing them all. As to Mendeley users at Cambridge, I know how many there were earlier this summer but can’t tell you. I would point out that putting “Cambridge” in your profile doesn’t guarantee you are at Cambridge, and your sign up email address being @cam.ac.uk doesn’t guarantee you are still there, either. As to how you disambiguate students/postgrads/postdocs/staff, that’s yet another matter – I don’t envy anyone doing this manually, but given the challenges of identifying people automagically without epic integration at present, this is probably the best way. Sounds interesting… Have you read Les’ posts on the repository-like nature (or not!) of Mendeley? I quite agree that my Google search may be a hit and miss affair, and cannot guarantee that results do correspond to folk who are actually currently at Cambridge. Some time ago I started mulling over a “qualification verification service” [ http://docs.google.com/Doc?docid=0AWbQbL4Lrd61YXo4bmc1NDM1cl8zNjlkdzM3M2tmcg&authkey=CL3h1rAD ] for verifying a person’s qualifications via a web service, but maybe some weaker form of verification – “yes, this person is a current researcher/acaemic” – based on an OAUth style handshake, maybe, would be useful for exploiting services like Mendeley within the institution itself? Yes, I’ve seen Les’s posts too. Pingback: How Many Unique Papers Are There In Mendeley? « O'Really?